The Application Designer Find In… function allows you to export PeopleCode search results to a file. 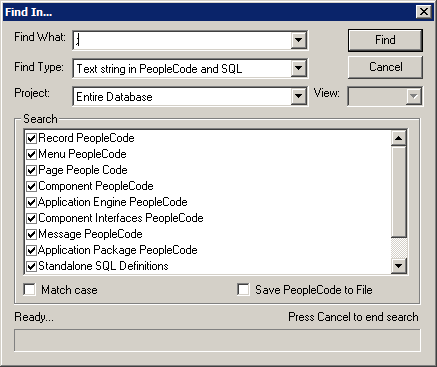 Having a searchable PeopleCode library as a text file (which can be quite big!) can be really handy at times. You may want to separate your PeopleCode exports (e.g. Record PeopleCode, Component PeopleCode, Application Engine PeopleCode, Application Package PeopleCode). If someone is looking for PeopleCode across all types they can simply grep all files. Caution - it takes a considerable amount of time (could be hours) to export all PeopleCode. This puts a fair load on your system so it would be wise to do this outside of regular hours. A regular export of PeopleCode from your development master is a simple of effective backup and if you put it into version control you have a very simple way of managing change.